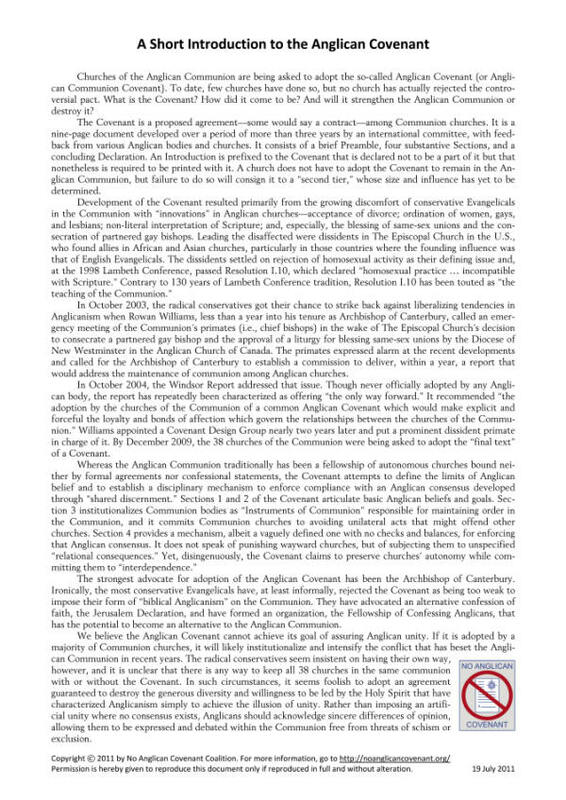 The No Anglican Covenant Coalition has today published a one-page handout titled “A Short Introduction to the Anglican Covenant.” The document is intended to provide a brief but useful view of the Covenant for those unfamiliar with it. It describes the Covenant, explains where it came from, and offers an evaluation of its possible effect. Anglicans around the world are encouraged to download “A Short Introduction” and to use it to educate their fellow Anglicans. A news release about the new handout can be found here. A letter-size version of “A Short Introduction” is available here and an A4 version is available here.